We are the Most Successful Rubber Liner In INDIA Specially for MSFE Equipments like ReBoilers,Tube Plates and Evaporators to Withstand up to 130 Deg Celsius Temperature and have received Various Commendations from from Almost all the Staple Fibre Viscose Rayon Plants in INDIA, THAILAND AND INDONESIA. At Arul Rubbers, we endeavor to achieve customer satisfaction through effective product realization with continual feedback from our clients. In fact, the company's entire business strategy is designed to ensure that the customer drives Arul Rubber's operations and goals. At Arul Rubbers, we are defined by our leadership qualities, factors that have made us the leading name in the development and manufacture of rubber products for a wide range of industries. Since inception, some four decades back, we have steadily grown to reach the position of eminence we hold today because our founder Mr.V.Vajravel envisioned a future where we would hold sway and define the new direction in whatever we set out to do. Today, we are the leading name in the area of rubber lining in the country, bringing our brand of expertise across a wide spectrum of industries. In fact, our area of competence extends beyond rubber lining and includes fabrication of tanks, vessels, pipes and fittings, outlet boxes, heater shells, tube holder plates, dished ends, evaporators, rollers, pulleys, gaskets and moulded components. We have also carried out various site rubber lining of phosphoric acid storage tanks, DM water tanks, HCL acid storage tanks etc., apart from specific services for the mining industry. Formed in the year 1978, we have since then, gone on to become India's foremost Rubber Lining Companies. 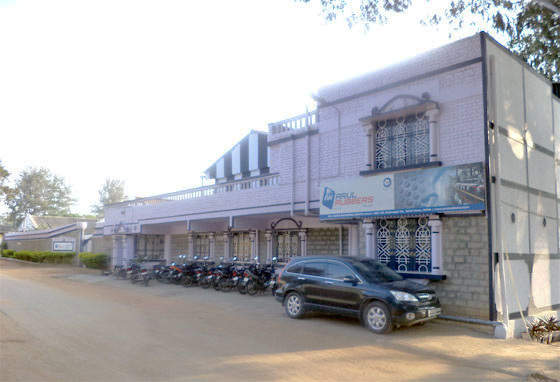 We are located in HOSUR, which is about 300 kms from Chennai Port and 40 kms from Bangalore. We are situated on the National Highway and have easy access to all parts of the Country. And the proximity to the Chennai Port gives us access to the Globe. We are a company that truly believes that our service is what separates us from our competition. All of our efforts are undertaken keeping our mission statement in mind which is to deliver complete customer satisfaction. Our strong team of dedicated Engineers and Technicians are committed to quality processes while simultaneously safeguarding environmental conditions. With such a great workforce,Arul Rubbers has emerged as one of the undisputed leader in the business of fabrication and rubber lining.